I need your help. I’m sampling J’ai Osé, and I can find barely anything about it in my books and on the internet. NST’s readership is a robust brain trust. Between all of us, we should be able to unearth the story behind J’ai Osé, including who created it and the differences between the original and current formulas. Another thing I know about J’ai Osé is that I adore it. This review is from a mini Eau de Parfum a friend gave me. It doesn’t have “Parfums Guy Laroche” on the bottle. Taking the lead from photos I’ve seen of early bottles, my mini appears to be from the post-Laroche days. J’ai Osé doesn’t break new ground, but neither does it smell old-fashioned in the way some chypres do. It’s solidly built and checks off the classic perfumery touchstones of grand notes, legible development, and interesting structure. But it lives in the serious-but-easy space that Halston does. It stands for a time when perfume wasn’t expected to be as easy to appreciate as a spice cake or a pina colada — a time just pre-Yves Saint Laurent Opium — but also when a bit of cheekiness was appreciated. 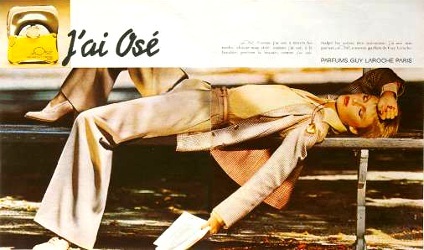 To me, J’ai Osé is a leather chypre inside a classic oriental fragrance. It starts off smelling like a late-1970s oriental with dry peach, wet orange blossom, and the tiniest hint of spice. “Aha,” you might might think, “Nose, prepare for a heady floral bouquet larded with amber and wood.” And then — surprise! — J’ai Osé plunges into sueded leather wrapped in iris and moss. It’s lovely leather, too — smooth and rich and barely salty. In the background plays a quiet mix of sweet, spicy wood, as if someone across the hall were wearing Christian Dior Dioressence. After a couple of hours, J’ai Osé’s moss ramps up — it’s the real thing, too, and a bit skunky on my skin — then poops out. J’ai Osé is dead. “Too bad,” you think. “But it was nice while it lasted.” Then, twenty minutes later, presto! It’s back! But this time it’s an oriental fragrance wafting a lush blend of resin, amber, wood, and musk. Finally, after a few more glorious hours, the fragrance really does fade to skin. J’ai Osé is big and sophisticated, but easy to wear. It smells like real, abstract perfume, and people who prefer their fragrance to be a Jo Malone-like easy-to-read mix of notes will probably find it stuffy and overwhelming. But if you do like perfume-y perfume, and especially if you have a thing for leather chypres and orientals, give J’ai Osé a try. As far as I can tell, it's still in production, and it’s a bargain at between $15 and $25 for 50 ml of Eau de Parfum. So, what can you tell me about J’ai Osé? It’s out there waiting for you! I don’t know anything about this, but I’ve set my FB people on it. We’ll see what they come up with, and I’ll report back. Thank you! It’s too interesting a perfume to be shrouded in such mystery (at least, to me!). Brian over at I Smell Therefore I Am has a wonderful review of this fragrance comparing it with a much more expensive perfume. Guess which one wins? I hope it’s this one! I’ll definitely look for his review–thank you! I read it and enjoyed it! It’s nice to know I’m not alone in appreciating the fragrance. This was one of my first perfumes and I wore it while I was still at school (late 70s through to early 80s) before switching to Opium and Boucheron (Silences and Calandre) . I liked it because it was strong , lasted all day and didn’t smell of flowers. Waterdragon has just reminded me of it. I loved the name of the perfume, it seemed to blend my punk tendencies with my discovery of French literature. What I find surprising is that is was available so easily in New Zealand (as was Fidji ). It was the antithesis of Hawaiian Tropical Blend which was the main smell around school. Have you worn it lately? It would be interesting to know what you think of it these days. I bet it would all come back…. I know just the sensation you mean! I wonder how the edp compares to the parfum? I see that FragranceNet has both for great prices. Very tempting, I love cheap thrills. I saw the same thing and had the exact same question! Angela, are you sampling vintage or current J’ai Osé? It’s hard to imagine that the current version bears much resemblance to the 1977 original. I’ve never tried this. It’s not one that I ever tried to buy on ebay because prices weren’t good. I suspect bottle collectors may have bid it up because of the striking design. Also, the ends of the stopper actually descend over the bottle, so it would have broken easily if not opened and close with care. Thank you! This is great information. I have to admit I don’t know much about Max Gavarry’s work, but this makes me curious! It’s so strange how J’ai Osé is almost a fragrance within a fragrance. Whoops–and I should add that I’m pretty sure my mini is the new version. Fragrantica lists the perfumer as Max Gavarry, who also did Air de Cabochard, Halston Z14, and Prada (Amber). This sounds gorgeous! And it’s sending me to dig through the black hole of samples as I seem to remember someone sending me a sample of this a while back. I hope so! I bet you have one and don’t even know it! I did. I looked through six of my perfume reference books with little success. I found the names of some Guy Laroche perfumes to be interesting: Clandestine, Horizon, and Eau Folie as well as J’Ai Ose. Isn’t it interesting how little was written about it, even when it was (supposedly) a popular item? ‘Click … click … click … ‘. Hear that? It’s the sound of me ordering a 15 ml bottle of J’Ai Ose. A while back a friend sent me a sample (of the post-Laroche version, I’d say) and although I liked it, I dawdled about buying it, even for the paltry sum fragrancex.com asks. Maybe that was because J’Ai Ose shares characteristics of a couple of genres, as you say, and it confused me. But also, I found the longevity is not fabulous. (But with a small bottle I c an spritz a bit more generously.) I do get the Halston comparison. Now I concentrate harder, I notice the leather/iris accord too – it’s great. Maybe that’s what’s making the lady in the ad swoon? Or maybe she’s overcome, having just learned how much she can save by buying J’Ai Ose over Chanel Cuir de Russie … ? Okay, the Cuir de Russie comparison is a bit flippant. But seriously, what ails that lady? I feel I should call for first aid. Maybe she’s realizing that the monotone look washes her out? I believe it’s stocked right next to the bandages! She dared, and now she’s pooped out. No more daring for the lady in the ad. Not without a nap immediately following it! J’ai Osé is such a great deal! I know the leather part fades after a couple of hours, but check back with your skin after yet another hour has passed, and you might get J’ai Osé, part two. Love this scent! I originally started exploring it when explorations of Fragrantica hinted that it might be related in scent profile to Nombre Noir. I actually don’t find much in common between the two (besides some fruit and a general chypre structure), but I do love J’ai Ose! It almost seems to me to be a sort of illegitimate stepchild of Mitsouko and the reissue of Lancome’s Cuir (floral leather + spices and peachiness). I also enjoyed, once, testing Clandestine, J’ai Ose, and Fidji at the same time, noting a white floral/green thread that they all shared (can’t quite put my finger on what the accord might be, but I do sense the shared DNA). For vintage hounds–I have explored a couple vintages on eBay. I found a propellant-pump of the vintage EdT after hearing how much it had changed over the years…to be honest, there is definitely a depth and leatheriness in the vintage that is not in the modern, but not a wholesale different fragrance or a blasphemous reformulation, IMHO, which some reviews indicated. Thank you so much for weighing in on this! First, I wholly agree with your comparison to a Mitsouko-Cuir de Lancome vibe. I get it, too. Next, I’m so happy to hear that although the vintage has its advantages, that the current version is not bad, either. Thank you! I haven’t yet ordered a bottle, but I’d better get on it. I have seen this online and I always wondered if it lived up to its ingredients list and positive feedback. I recently purchased the radically reformulated Magie Noire and am disappointed to say the least, so this little beauty just might help me over my disappointment, haha. I’ve got my eye on a 50ml bottle for €25, (which is virtually free) and it’s pay day tomorrow, and my birthday’s next week, so really, it’s a no-brainer. Thanks Angela. I think. I hope it lives up to my hype! Or, that it at leasts washes the bad taste of the new Magie Noire from your mouth. And, happy birthday! Thanks Angela. Here’s hoping. It is winging itself to me now. It’s arrived, and yes, it most definitely lives up to the hype. It has a very old-school vibe which is increasingly hard to find these days, especially in reformulated fragrances. My bottle is the newer stock, without Guy Laroche on the label. I’m glad you’re not disappointed! Thank you for reporting back. Thank you for the link! I didn’t 100% share the same experience he did with J’ai Osé, but I appreciate the review.